23675 Private Algernon John Ball of the 2nd Battalion, the Royal Warwickshire Regiment. Son of Samuel and Annie Ball of the Cleave, Kingsand, Plymouth. Born in Kingsand in the March Quarter of 1890. Died 1 October 1917 aged 28. 196501 Petty Officer Alfred Benltey RN, HMS Defence. Son of the late Edmund and Sarah Bentley; brother of William D. B. Benltey of 4 Fore Street, Kingsand, Plymouth. Born in Co. Cork, Ireland in 1882. Died 31 May 1916 at the Battle of Jutland aged 33. M3277 Engine Room Artificer 4th Class Frederick James Vaughan Carne, RN, HMS Indefatigable. Son of Frederick Henry and Elizabeth Ann Carne of Kingsand, Plymouth. Born in Maker in 1896.Died 31 may 1916 at the battle of Jutland aged 20. 27520 Private John Edward Fuge of the 8th Battalion, the King's Own Royal Lancashire Regiment. Son of John Henry and Hannah Fuge of Millbrook, Plymouth. Born in Maker in 1897. Died 9 May 1915 aged 29. Lieutenant Henry Mills Goldsmith of the 2nd Battalion, the Devonshire Regiment attached to the Lincolnshire Regiment. Son of Mr and Mrs J. P. Goldsmith of Devonport; husaband of Sybil E. Goldsmith of Rockmoor, Yelverton. Born in Compton Gifford in 1866. Died 9 may 1915 aged 29. 154459 Chief Petty officer Henry Clarence Hooper, RN, HMS Defence. 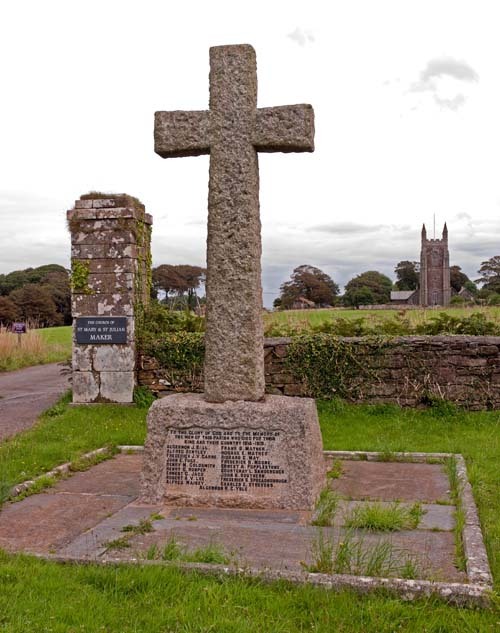 Son of Henry and Priscilla Hooper of Cawsand, Cornwall. Born in Rame 9 March 1875. Died 31 May 1916 at the Battle of Jutland aged 41. J/23165 Boy 1st Class Ernest George Jago, RN, HMS Monmouth.Son of Richard and Blanche Jago of Market Street, Kingsand, Plymouth. Born in Maker in 1898. Died 1 November 1914 aged 17. There seems to be some error on the Memorial. No-one with the name of Robert A. V. Lee is listed on any casualty lists for World War 1. However Chief Gunner Robert Thomas Hawton Lee RN, HMS Monmouth is listed. Son of Frederick and Emma Lee of Kingsand; husband of Jessie Beatrice Noel Price (formerly Lee) of 136 Beaumont Street, Devonport. |Born in Cawsand 14 February 1871. Died 1 November aged 43. 38675 Bugler Alfred George Maisey of the 28th Fortress Company, the Royal Engineers. Son of Elizabeth Jane, step-son of Edward Bowden. Born in Maker in 1902. Died 16 October 1918 aged 16. 26553 Corporal Frank Brunning Mather of the 10th Battalion, the Duke of Cornwall's Light Infantry. Son of Lucy Mather of Melrose, The beach, Kingsand, Plymouth and the late John Mather.Born in Kingsand in 1890. Died 16 February 1918 aged 28. 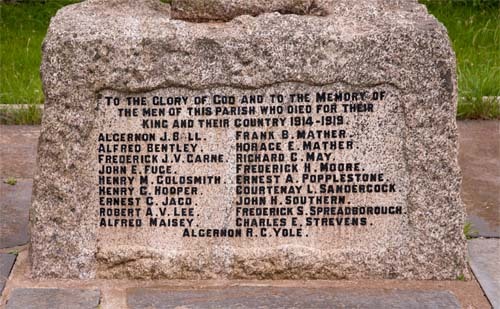 2866 Private Horace Edgar Mather of the 1st/4th Battalion (Territorials), TheDevonshire Regiment. Son of Ernest and Bessie Mather of The Green, Kingsand, Plymouth. Born in Kingsand in 1895. Died 10 July 1916 aged 21. Richard Charles May, son of Ellen and Richard J. May. Believed to have been born in Torpoint. Details of his military career are not yet known. 239988 Gunner Frederick Herbert Moore of the Royal Horse Artillery and the Royal Field Artillery. Died 20 November 1918. M5643 Engine Artificer 3rd Class, RN, HMS Resolution. Husband of Elizabeth E Baker (formerly Popplestone) of Tremar Lanr, St Cleer, Cornwall. Born 19 August 1890. Died 28 October 1918 aged 28. Buried in Ford Park Cemetery, Plymouth. Sub-Lieutenant Courtenay Lyne Sandercock of the RNVR, HM Trawler Lochiel. Son of John and Mary Lyne Sandercock of Empacombe, Mount Edgcumbe. Born in Maker in the March Quarter of 1896. 15103 Lance Corporal John H Southern of 56 Field Company, the Royal Engineers. Son of Mr and Mrs J. Southern of Kingsand, Plymouth; husband of Elizabeth Ethel Southern, of Greenland, Anderton, Plymouth. Died 11 December 1915 aged 33. 52849 Company Sergeant Major Frederick Samuel Spreadborough of 126th Field Company, the Royal Engineers. Born in Brighton in 1873. Died 15 January 1916 aged 44. Bosun Charles Edward Strevens RN, HMS Superb. Son of Henry and Emma Jane Strevens of Market Street, Kingsand, Plymouth. Born in Milbrook 23 May 1889. Died 8 December 1918 aged 28. S 5115 Sapper Algernon Richard Clarence Yole of the Royal Marines, 3rd Field Company Divisional Engineers. Son of John and Emma Yole. Born 5 November 1887 in Lynesack, Durham. Died in Gallipoli 10 December 1915 aged 28.